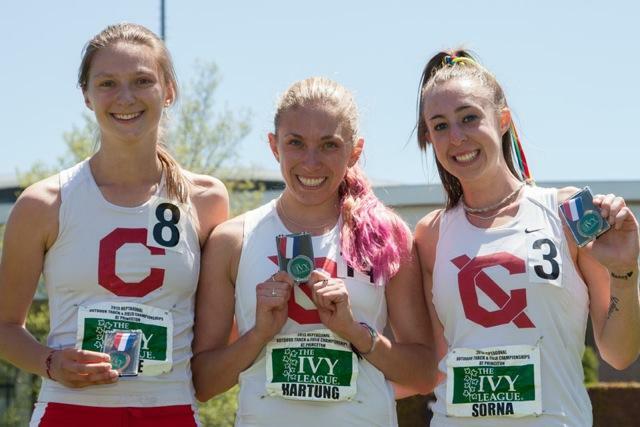 Three times a year the Ivy League teams gather for the conference championships, aka the Heptagonal Championships or The Heps, as they are so affectionately called, and three times a year all notions of moderation and sanity are thrown completely out the window. At no other meet and no other point in the season would it be advisable or even allowable to attempt the feats that have been done at that meet – doubles, triples, quadruples, back to back and simultaneous events – but when a Heps title is on the line, you do whatever it takes to get the job done. In the week leading up to the 2013 Outdoor Heps, my training partner and best friend, Katie Kellner, started talking about the possibility of doing the triple – 10k, 5k, 3k (10k Saturday afternoon, 5k Sunday morning, 3k Sunday afternoon). It was an epic feat of strength and determination, one that had only been done before at the Heps by a handful of courageous women. It was something she had always dreamed of doing, and that year, her senior year, Arthur was finally considering letting her do it. We had a legitimate shot at winning the team title, but to do so, we were going to need to fight for every single point. Katie running three events put her in contention for an outstanding maximum of 30 points. It would be incredibly tough, no doubt, but she was prepared both physically and mentally to handle it. I was in awe of her bravery and willingness to lay it all on the line for our team, but the moment she brought up the possibility of her triple, a seed was planted in my brain – I want to triple. I had doubled that year in Indoor, 5k/3k, and at the outdoor Heps the year before in the steeple/3k, but I wanted to do more. I knew I could handle more. One day at practice I finally said to Arthur, I want to run the 5k on Sunday, in addition to the steeple and 3k.He looked at me and smiled that classic Arthur smile, one that said, that’s very valiant of you, but not only is it insane, it’s physically impossible. He went on to inform me that the 5k was to be contested 40 minutes before the steeple, something that I had, in my exuberance, unfortunately overlooked, which would give me approximately 25 minutes to cool down, warm up and prepare to toe the line again between events. Instantly my mind began to race and recalculate. Suddenly, without thinking, I blurted out, What if I do the 10k? His initial reaction was absolutely no. 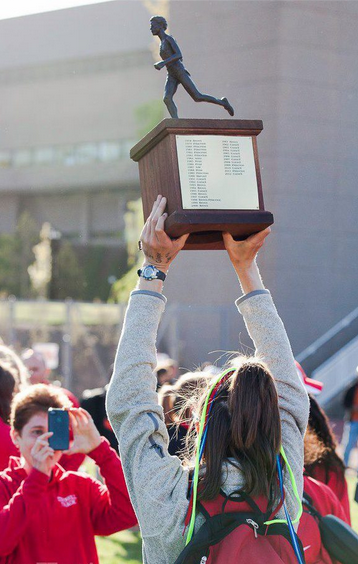 Donn Cabral had done the 10k/steeple double his sophomore, junior and seniors years, but no woman in Heps history had done that double, let alone thrown in the 3k for good measure. But every day that week I mentioned the idea to him, how much I wanted to do it and how prepared for it I felt. Finally, on the day that the entries for the Heps were due, he came to me at practice and asked, You’re sure you’re ready for this? I told him I knew I was, and he said he knew I was too. Every single person I talked to told me the exact same thing when I asked them what a 10k felt like, “For 4 miles the pace is fine and you feel great, and then all of a sudden it gets hard and you feel like death”. I took what they said to heart, and stored it in the back of my mind, but honestly, I didn’t believe it would be as bad as they said. 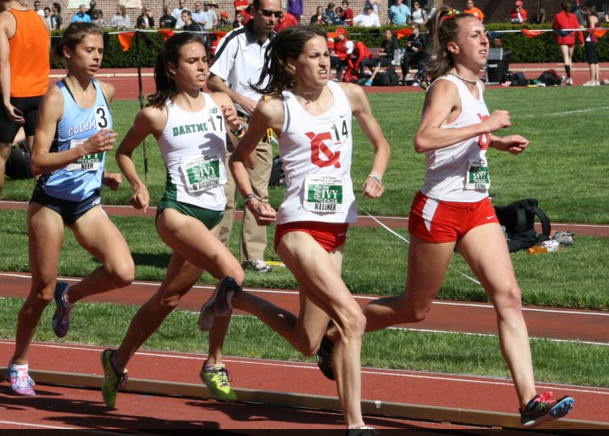 The plan was that Katie and I would trade off the lead every 800m and run 81’s – 33:45 pace. The goal was to keep the pace honest and break the field, hopefully so we could cruise at the end. It will be like a tempo run, Arthur said. It will be fine, he said. It did feel like a tempo run…for 4 miles at least. We shared the work just as we planned, dropping people one by one as we went. By halfway we dropped everyone else in the race, except one girl – Brown’s Olivia Mickle. Lap after lap, mile after mile, she was still there. When we came around with 2 miles to go and she was still tucked right behind us in third, I knew things were going to get ugly. True to everyone’s advice, all at once it hit me. The relatively moderate pace we had been running suddenly felt like a sprint. I remember looking at the clock and thinking I have been racing for over 20 minutes, but I still have another 10 to go?! With a mile to go, Olivia took the lead and started to press. I thought to myself, Who kicks from a mile out?! What kind of torture is this? It took every ounce of mental and physical strength to hold on. Then with a lap to go, Katie threw down. Olivia followed. I had no response. Never before in my life had I felt the way I felt in that moment. It wasn’t pain. It wasn’t tiredness. It was an entirely new world of physical discomfort, one that transcended every race and workout I had ever done. I gave all I had that last lap and held on for 3rd – 33:34.59, in my debut 10k. As I lay on the ground afterward I remember thinking to myself. I survived. One down, two to go. 99.9% of what I did that weekend was for my team, but that steeple was for me. I had already won my first Heps title during Indoors in the 3k, which was a big moment for me in its own right, but to earn my first steeple title was even more special. My freshman year I was third and my sophomore year I was second. That year, my junior year, it was finally my turn. Before the race, Arthur told me to go out and just enjoy it. And that’s what I did. 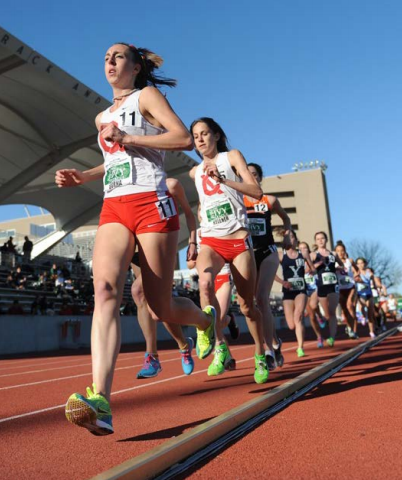 I lead wire to wire to win in 9:58.96, just barely missing Alexi Pappas’s meet record from the previous year, 9:58.90. That race was probably the best I’ve ever felt in a steeple. I felt strong and relaxed and comfortable the entire way. My hurdling was smooth, my water-jumps were explosive, and I was able to stay even throughout. As I was running, I truly was able to soak it all in. My family had come to watch and I could hear them cheering. My teammates got a CU chant for me going down the home stretch. It was great. But the best part didn’t come until the very end. I crossed the finish line and turned around to see my teammates, Genna Hartung and Claire DeVoe, get 2nd and 4th respectively. Together we scored 22 points. It was an absolutely magical race. And it was the boost of confidence and motivation I needed for the big finale. Ten minutes before the 3k went off, Columbia scored 20 points in the 200m and pulled ahead in the team standings. As I watched the race unfold from the infield where I was doing strides, a wave of adrenaline coursed through my body; there was no turning back now. There were five of us entered, the maximum number of entrants you can have in one event, and just before we got on the line, we huddled up. I remember putting my arms around my teammates, not just to keep them close, but because I honestly felt like I might collapse at any moment. I went to give a pump up speech, but all that came out was a stream of incoherent babbling and tears. I was delirious. I had never been so exhausted in my entire life. Every ounce of my being told me that there was absolutely no way I could make it through another 7.5 laps around that track. But before I knew what was happening, the official was calling us over. So I cleared my mind of all doubt, stepped up to the line, and told myself it was time to see how deep the well truly ran. When the gun went off, I immediately went to the front and started to grind. That race was going to hurt no matter what, so I figured I might as well do it my way. Even on my third race of the weekend and second race of the day, an honest, fast race was still my best shot at scoring high. After 800m of towing the field by myself, Katie pulled up next to me. In that moment, I knew we were going to be OK. For the next mile we ran side-by-side. We pressed and poured until only four remained – us, Abbey, and Waverly Neer. With 800 to go Abbey made a move to the front. For 400 meters the three of us chased after her, jockeying for position in preparation for what was to come. Coming down the straightaway heading into the last lap, Waverly moved in front of us. For just the briefest of moments I thought I was done, that I couldn’t respond, but when we hit that bell, something inside me just broke. I took off like never before in my life. Two seconds later I moved back into second. I was running for my life. With 200 to go, Waverly came up on my shoulder, and by some miracle, I found another gear buried deep within. I ran my final 200 in 32 seconds and held on for 2nd behind Abbey, running a 9:29.08. I crossed the line and collapsed to the ground in sheer joy and pure exhaustion. By the time the race was over, the results from Women’s Shot Put were in – Victoria Imbesi had won. Her 10, plus Katie and mine’s combined 10, put us back in the lead. And in a final display of teamwork and dedication, our sprint and mid-D girls then carried us home in the 4×8 and 4×4. We ended up winning the meet by 24 points, 145 to Columbia’s 121. I will never forget how it felt to celebrate with my team on the field after it was announced. I was so proud of everyone and everything we had accomplished. I was proud of the people who came out of nowhere and scored big. I was proud of the people who fought for 6th place. I was proud of the people who had off days but never gave up. I was proud of Katie for the confidence and poise she showed throughout the meet. I was proud of myself for having the courage to attempt something that had never been done before and the strength to see it through. As exhausting and insane as it was to do that triple my junior year, I did it once more my senior year. Strangely enough, I got exactly the same places and ran almost exactly the same times. Full results of the meet can be found at the best track and field blog on the planet, HepsTracks.com!